Click on the image below for remote connection from mobile devices. Works for iOS, Android, Google Play, Microsoft and Blackberry devices. Vmed monitors can be shipped with an optional Windows tablet for mobile display. Software and Bluetooth are pre-installed and ready to go. Vmed monitors now include ECG interpretation software. Vmed wireless monitors now Integrate with AVImark®. Click here for a description or here for instructions. Read the article, “Bluetooth Stops Spaghetti Syndrome” in Veterinary Practice News by Dr. Don DeForge. You can connect to Vmed software from any WiFi enabled device. Go Wireless…Go Digital with Vmed Bluetooth wireless monitors. Bluetooth is highly tolerant of interference and is omni-directional to a range of 100 meters, line of sight. All controls except keyboard entry are at the patient’s side. Save space, eliminate cables and store files automatically. Vmed wireless monitors establish a wireless link to your Windows desktop, laptop or tablet computer to display real-time patient monitoring waveforms and digital data on your computer screen. Monitor up to seven patients on one computer. Files may be recalled for ECG and CO2 waveform analysis, transmitted by email or printed in a concise report. All hardware, software and monitoring accessories are provided with our multi-parameter patient monitor and our ECG monitor as described below. Works best with Windows 7, 8 and 10 computers. PC-Display software is provided with each wireless monitor and allows real-time viewing of all monitoring information on your Windows computer. Cables and bulky equipment are a thing of the past in the modern veterinary surgical suite with VetGard+ monitors. Artifact suppression and low noise electronics offer the cleanest, most stable ECG trace possible. 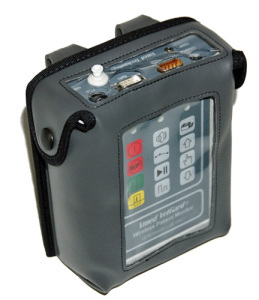 The VetGard+ is equipped with the Nellcor Vet-Sat animal tested digital pulse oximeter. Blood pressure and CO2 modalities are also tested and verified for use on small animals. 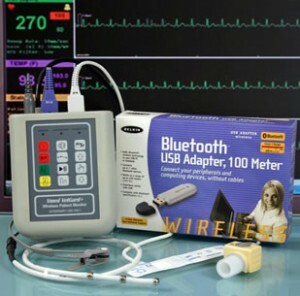 A full range of sensors provide digital readout of heart rate, respiration rate, core body temperature, blood pressure, blood oxygen saturation levels and inspired/expired gases including CO2, N2O and five anesthesia agents all combined in a compact, battery operated monitor with revolutionary software for an interference free, wireless link to your computer. By selecting a large screen display connected to your desktop, laptop or tablet computer, patient monitoring displays are visible as never before. The PC-VetGard+ can be used in the exam room too. Use the included chest sensor and low force skin clips for quick ECG exams and pre-surgical screening. Use the Vmed ECG Interpreter ECG interpretation software to screen for heart abnormalities that may cause problems before, during or after surgery. Rechargeable Li-Ion battery for over eight hours of use. Free software upgrades for the life of the product. Both 32-bit and 64-bit versions of Windows Vista, 7, 8.1 and 10 are acceptable. Please read this if you have or are considering using a Microsoft Surface Pro tablet with your Vmed device. See our Downloads page if you are interested in trying our software.